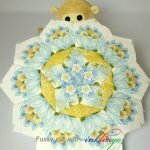 In Part 1, I showed you how I break my variation of Can Can (Millefiori Quilts 3) into sections to count the shapes in each color. This is the first step to deciding how much fabric I need. 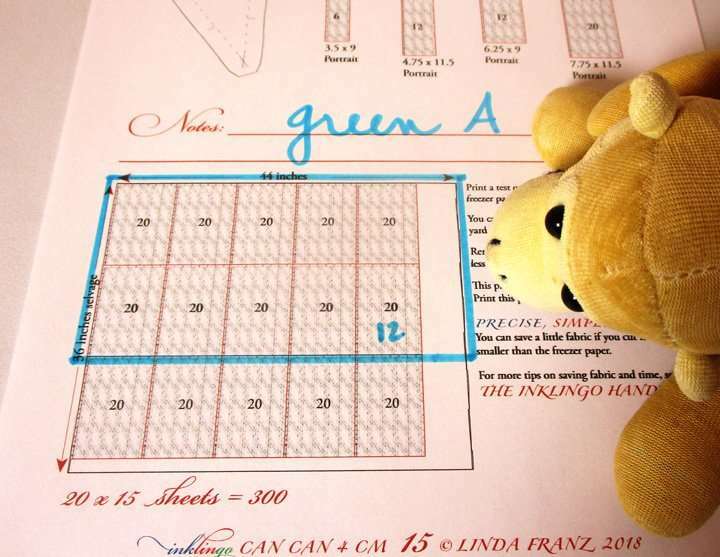 As promised, I have a few tips for counting the shapes and determining the fabric requirements if you make your own variation of Can Can—or any other design! I’m using Can Can as an example, but if you follow along, it will give you confidence that you can adapt ANY design to make it uniquely your own. Monkey says there is a lot of detail in this article but it’s worth it. 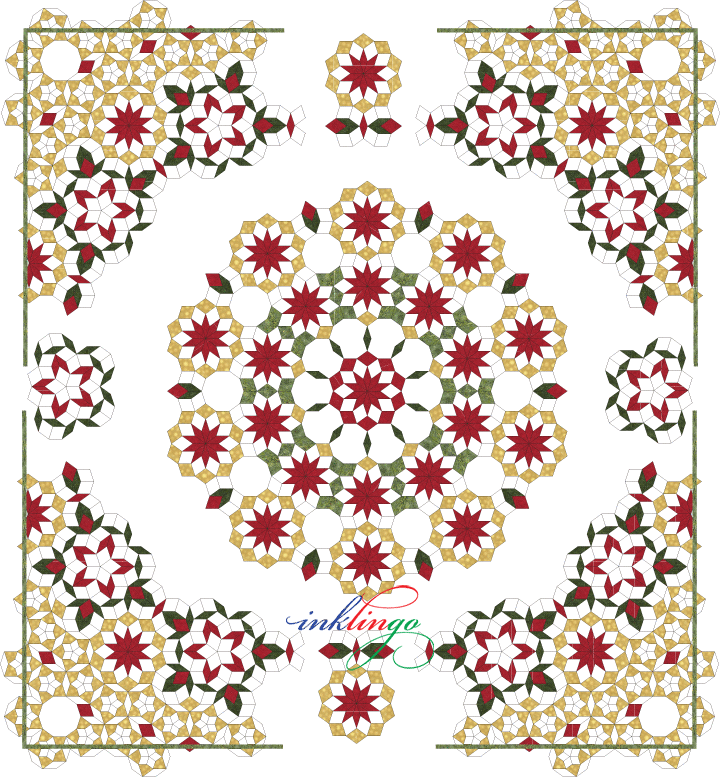 Of course, the beautiful Millefiori Quilts 3 book indicates exactly how many A, B, C and D shapes you need for the original Can Can color scheme. No counting required! 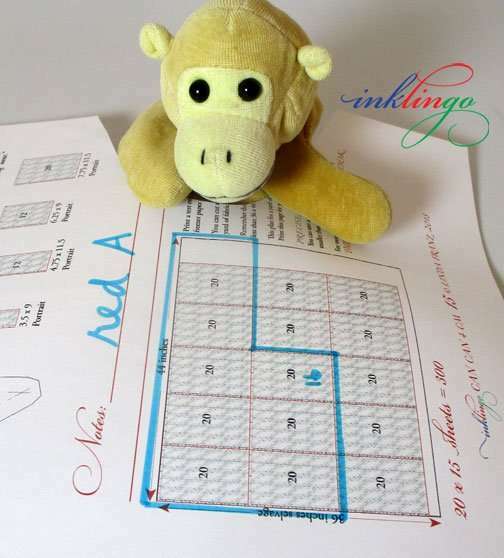 However, you will need extra fabric because the Inklingo Can Can shapes are larger than the ones in the book, by request. 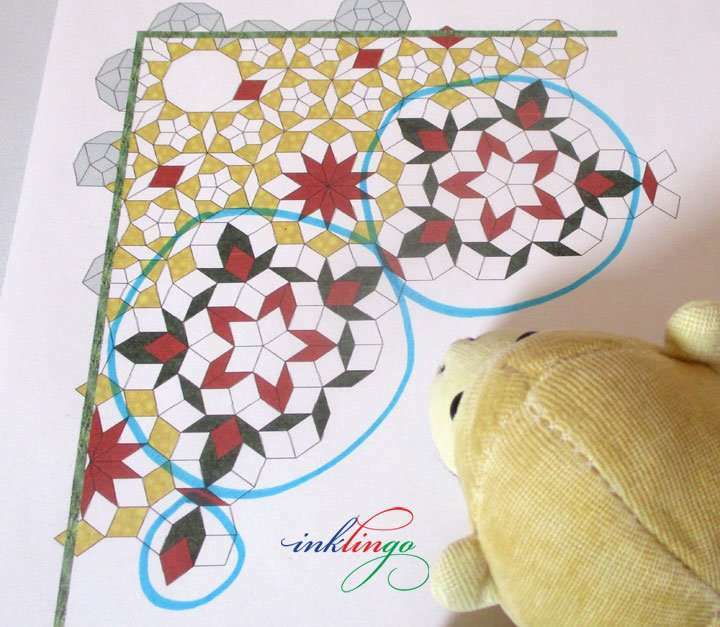 No matter which variation you make, the book includes detailed diagrams for assembling the top. Good news. 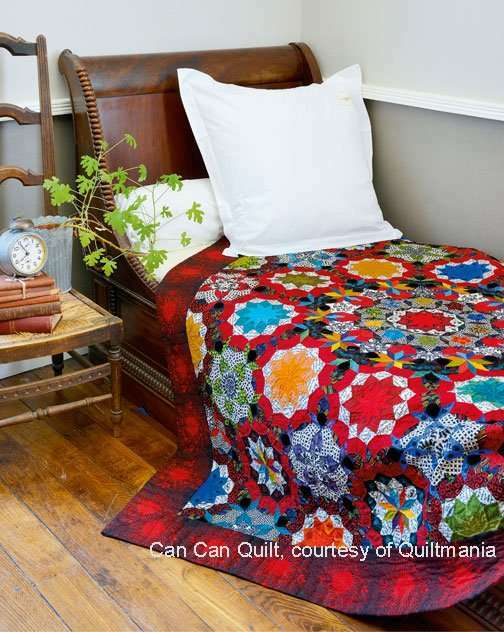 We just had more Millefiori Quilts 3 delivered, ready to send to you. My corners are different from the ones in the book. 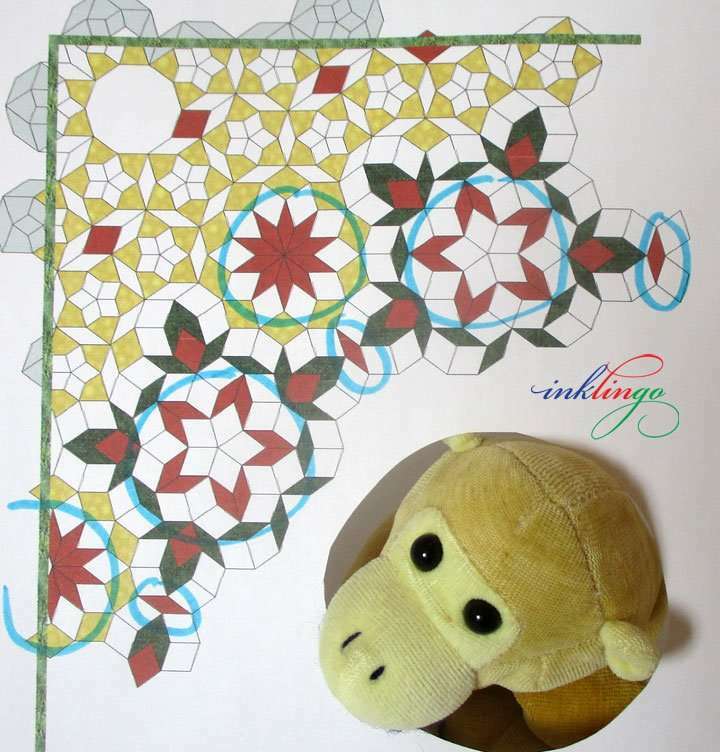 In this example, I count the shapes in one corner of the quilt (see Part 1) and multiply by 4. There are a few ways to approach the counting. I printed the corner several times, so I could isolate each color and each shape. Focus on one at a time. Let’s isolate the green shapes first. All of the green shapes are the same—A diamonds. In this case, it is possible to see groups of shapes to minimize the counting. I have circled groups of green shapes with a blue highlighter. The green is easy to isolate in groupings like this one—and even isolate groupings within the group! Within this group, I was able to count 4 groups of 5 shapes with 3 left over, for a total of 23 in this group. Count one group and multiply. Multiply by 2 groups = 46 PLUS there are two more green A, so I got a total of 48 A for one corner, 48 x 4 for 4 corners = 192 green A shapes. This way of counting is easy. Any time you can make it easy, it is likely to be more accurate too. Page 15 of the Inklingo Can Can shape collection shows 300 A from a yard and I need 192. The layout shows that it would be simplest to print 10 sheets of 20 for 200 (outlined in blue) and I don’t mind having a few extras. If you are conserving every little bit of fabric, you could print 9 sheets of 20 and 1 sheet of 12 to get exactly 192. Either way, allow about 2/3 of a yard. This method works for the red fabric too, for which you need some A and B diamonds. I circled 3 groupings of 10 red A shapes, plus another with 6, and 3 more singles. Total = 39 x 4 corners = 156. 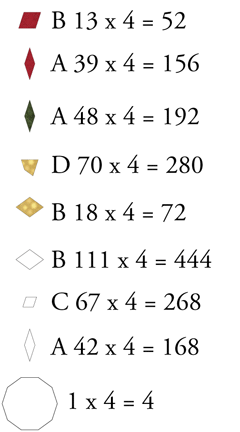 There are only a few B diamonds, which I count one at a time (13) and multiply by 4 corners for a total of 52. I might wait a day and repeat, just to double-check my numbers. On the other hand, close is often good enough. I might be satisfied with “approx 156 red A diamonds” and feel confident that I will allow a little extra fabric. Page 15 of the Inklingo Can Can shape collection shows 300 A from a yard and I need 156. The image for a yard at the bottom of the page shows that one option is to print 8 sheets of 20 (160). I might decide to add a little extra, if I am not confident that I counted everything exactly. 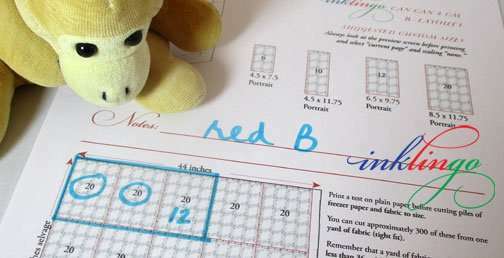 If you happen to have slightly less than a yard of a good red in your stash, and you want to see if you can make it work, you can arrange and re-arrange the representations of the sheets of fabric for A and B, to see if you can make it work, using the method I showed for Golden Wedding Ring in a previous article. I looked for groups of 10 B diamonds and 5 D kites to make the counting simpler. I subtracted unnecessary D kites, which are grayed out on the edges. For the gold shapes B and D, pages 21 and 33 of the Inklingo Can Can shape collection have the info I need. I start with the shape that requires the most fabric, which is D in this case. For 280 D, printing 16 sheets of 18 would allow a few extras (288), which I have outlined in blue. I still need to print 72 B and the diagrams on page 21 indicate that I would need about another 12 inches of fabric. 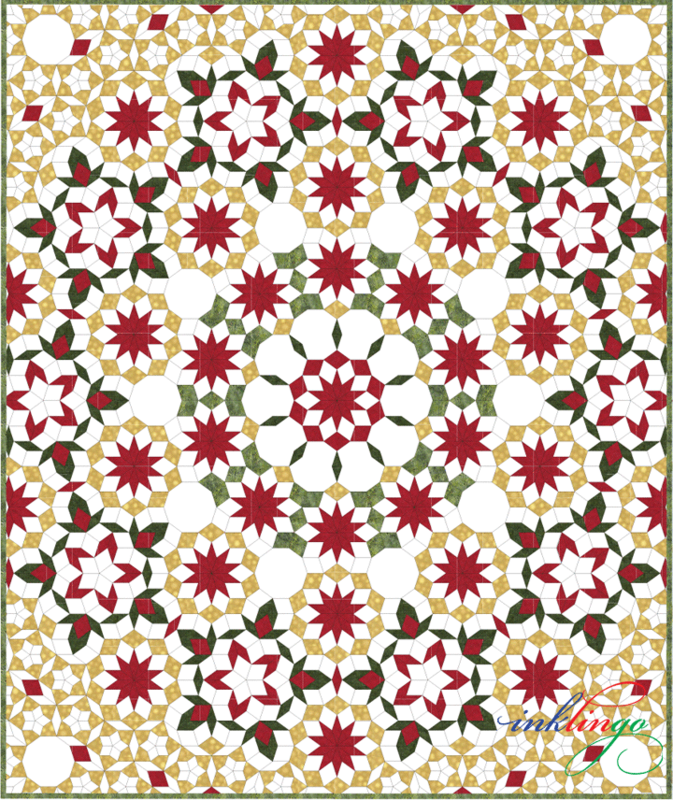 When I counted the white shapes for A and B, I found it difficult to find a pattern the way I did for the red, green and gold shapes, so I just manually counted, making a mark on each shape, so I could be sure not to double-count or under-count. I used a dash to indicate I had counted the white A shapes and a circle on the B shapes. The white C shapes are all in sets of 5 for stars, so I can just count the stars, multiply by 5 and subtract any that I don’t need on the edges. Page 21 shows 300 B from a yard, so 444 would require about 1.5 yards. Page 27 shows 525 C from a yard, so 268 is more than half that (above). Page 15 shows 300 A from a yard, so 168 is a little more than half that. Finally, to finish the puzzle, add up the approximate amounts. If you want it to be exact, position the representations of fabric sheets on a yard of fabric. (PDF to download with Golden Wedding Ring example). 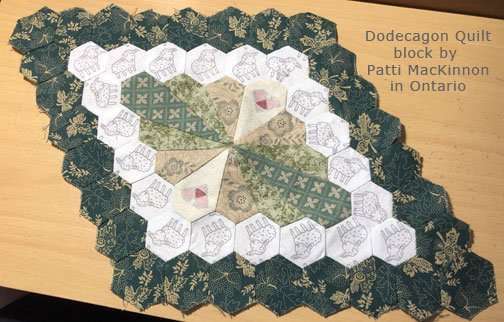 For the white decagons, print page 290 on freezer paper to cut out the shape for the plain decagons and allow fabric for 4 of those too. 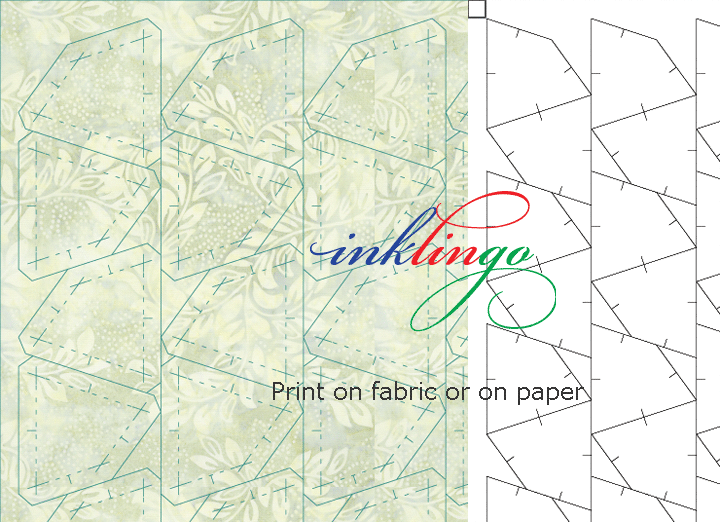 I print the Inklingo layouts without seam allowances on freezer paper for templates, instead of printing on fabric. Cut on some lines (blue outline) and not on others to get the decagons for this variation of Can Can. 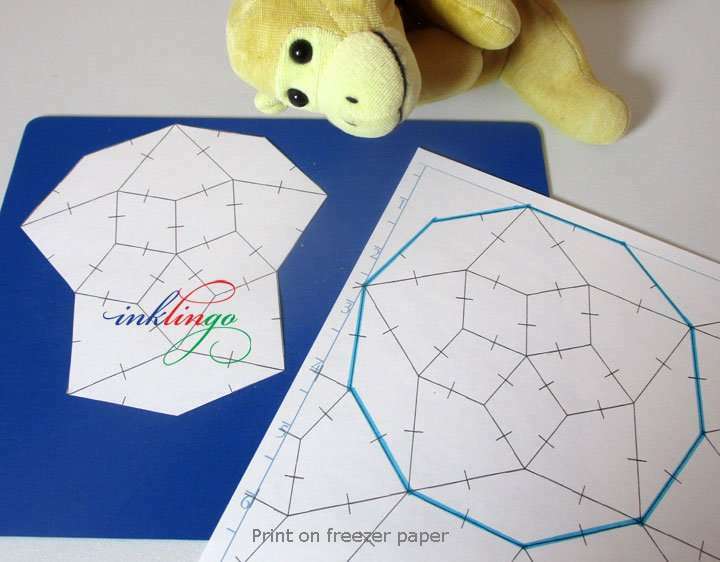 We prefer to print on fabric but freezer paper templates are perfect when a shape is not Inklingo-able. 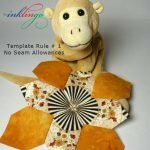 I started teaching how to use freezer paper templates long before Inklingo, ever since my Quilted Diamonds books (2002, 2004). 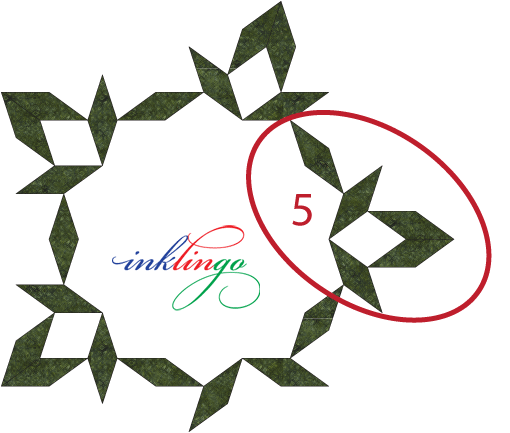 As usual, the Inklingo Can Can shape collection includes shapes with and without seam allowances, so you can print on fabric or on freezer paper. With this and the tips in Part 1 of this article, I hope you will feel confident that you can adapt any design—not just Can Can—to make it simpler or more complicated that a pattern prepared by someone else. 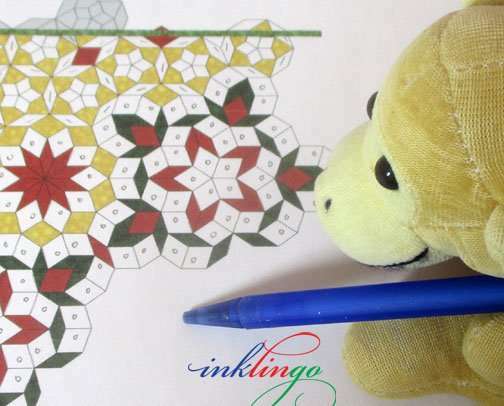 Using this approach might cut into the time you have available for crossword puzzles or Sudoku but it will enrich your quilting life! Adapting a pattern to suit your tastes takes a little time but when you know what you need, you can do the printing quickly and be ready to sew. For this design, I sew some seams by machine to get a fast start and some seams by hand with a running stitch, so I have a relaxing PORTABLE project for the holidays too. Computer + your Inkjet printer + free Adobe Reader and Inklingo shapes to print. That’s all! 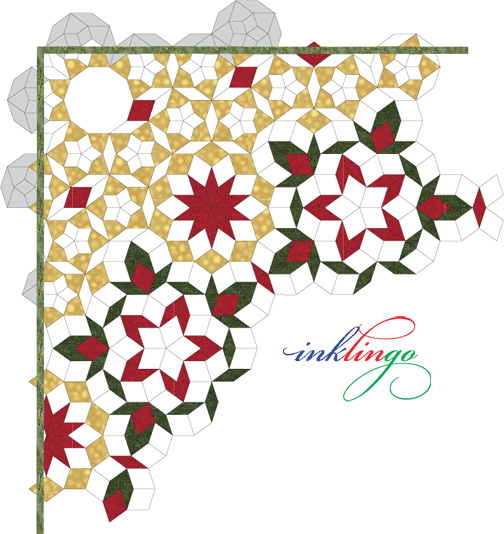 No special ink, no special equipment because Inklingo is all about making quilting more accessible. 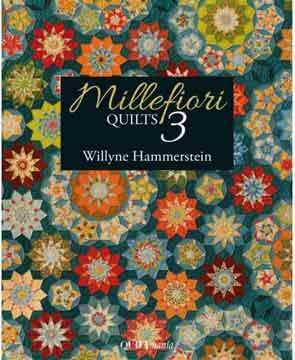 Main Millefiori Page for the Millefiori Quilts books and shape collections. If you have more tips and tricks for counting shapes, I would love to hear about them too. Thank you for visiting. More coming soon! This is great. Thankyou Linda. I wish my mind worked like yours does.lol. You make it so easy to calculate things like this for ourselves with these lessons! 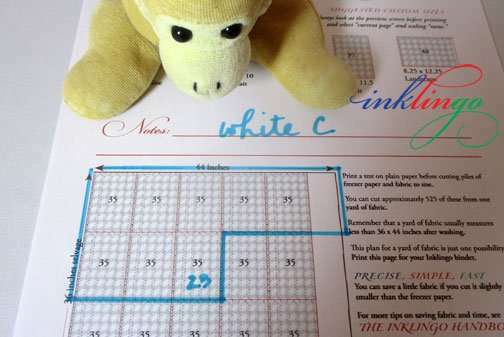 Love the pointer about putting the mark in the white squares when counting them – I did that instinctively when figuring that out for the variation of Can Can I’m making, all thanks to lessons I’ve learned from you over the years! !